Welcome to the kick-off page for Australia. 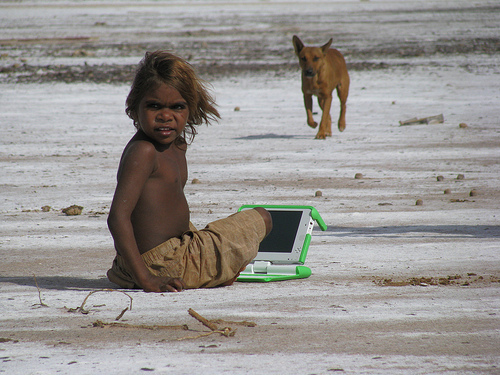 OLPC Australia was launched in March 2008. They received a small batch of laptops to distribute as that independent Foundation could manage it across pilot projects in the region. Technical development is co-ordinated at https://dev.laptop.org.au/. See the Participation page to get involved. Some of the key technical projects supported by OLPC Australia. XO-AU: an Australian-specific software build for XOs. It contains localised settings and content suitable for Australian children. It has been developed in consultation with schools, educators and local communities. XS-AU: a reconfiguration of the XS school server. Mini Server: A mini update server that runs on an XO. Other XOs can wirelessly update their OS from it, using olpc-update. In a sense, it is like Nandblaster, but data (including the Journal) is preserved. XOP: An XO racking and charging solution. The charger developed by OLPC Australia is better suited for the racks than the OLPC version. These are community groups assisting OLPC Australia. The Melbourne XO Club meets monthly. OLPC Australia personnel are often present at the Sydney Linux Users Group. Deployment Status warning.pngEmpty strings are not accepted. Last edited on 07:33, 29 May 2012. >5,911 views of this page. One Laptop per Child and the OLPC logos are trademarks of OLPC.